Three foreign workers from Thailand were injured Saturday by a mortar shell that exploded in a kibbutz at Sha'ar Hanegev Regional Council. One of the men sustained moderate to serious injuries, a second one sustained moderate wounds and the third man was lightly wounded. Two of the three were transferred to Soroka Medical Center in Beersheba for medical treatment. Magen David Adom said all three suffered shock. The military wing of Islamic Jihad, the al-Quds Brigades, took responsibility for the attack, claiming it targeted a military base. The group issued a statement saying its cell managed to fire a total of six mortar shells. "It's the resistance's right to stand up to any Israeli aggression against the Palestinian people," the statement said. Meanwhile, Southern Command Chief Tal Russo vowed to respond to the mortar strike, saying that "we will take care of the masterminds and those who executed it." At approximately 14:20 pm four mortar shells were fired from the Gaza Strip. The shells exploded in a residential area in the kibbutz, where the foreign workers lived. The man who sustained moderate to serious injuries had shrapnel penetrate his chest, while his friend was sustained leg injuries. The mortar shell also killed a cat nearby. 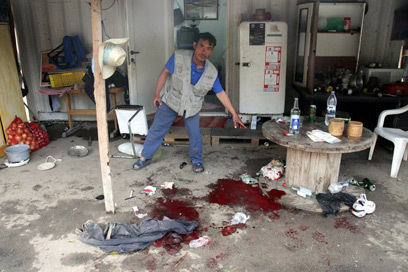 The head of the local emergency unit told Ynet that three shells exploded in an area between the Thai workers' houses and the cowshed. He said several bystanders suffered shock but refused to be taken to the hospital. The official added that the workers feared for their lives and that after the incident the residents were told to go into the shelters. "We heard three explosions and immediately understood that it was in the kibbutz," said Yoram from the local emergency unit. "It took us a few minutes to pinpoint the landing sites Later we will convene all the members and give instructions for the next few hours," he said. See all talkbacks "3 Thai workers hurt in mortar strike"